Late last week we received a delivery of new aviation books, with these three title amongst them; pre-ordered items can now be collected. Last admission to shop is at 4.40pm daily; and the museum closes at 5.00pm; this may vary during bad weather conditions. 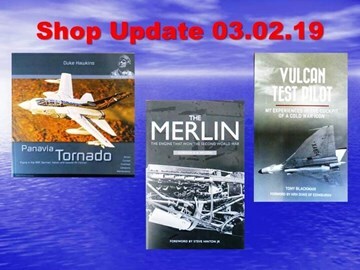 All profits from the Museum Shop are covenanted to the museum to help fund its on-going development; so rather than shopping online or elsewhere please pay us a visit soon and help support your aviation heritage!